I've been reading this board since I rescued my Pyr in December, but hadn't posted until today. I have 3 kids (4 if you count my husband) ages 5, 7 and 8, plus Breezely (our Rescued almost-2-yo Pyr) our foster girl Morgan (Pyr who is about 2), Cassidy (our beautiful 13.5 yo Border Collie that we've had since she was 6 wks old) and Gomez (the Wonder Chihuahua, who is 1 and rules the roost). I'm sooooo in love with my dog, but the big dog captured my heart completely in an instant. Our rescue here in Florida is so over capacity, so we began fostering another about a month ago. They are the most wonderful, amazing dogs I've ever encountered and consider myself sooo lucky to have them. I am doing my best to find Morgan her forever home, but am in no hurry for her to leave us. Anyway, that's us. We are a very busy household . I've learned a lot just reading. Thanks! Welcome to BPO! I have a rescue Pyr also, Jenny--I adopted her this past October and have fallen in love! I also have Tipper, my sweet Golden Retriever/Sheltie mix, 2 cats, and my almost 5 yr old twin daughters (and my husband, of course!). Glad you're here! Isn't it funny that so many of us 'BIG DOG LOVERS' have tiny dogs too ... although, SHHHHHH ... never let THEM know they're tiny dogs, HA!!! Your Family sounds fantastic! Skin & Fur. Can't wait to hear more and also see tons of pictures of the whole family. Big. Small. Fur or not. Also want to put a note in here to tell you and all who Rescue and Foster how very special you are. You are pure GOLD! Hope you know that. I couldn't get my husband to exactly agree to adopt another, but he readily agreed to foster after we learned the rescue was turning dogs away daily because there was just no room for more. And the dogs that we had to turn away, well.... it's not a happy ending. So I figured there was somehow room for one more (what's one more in this C-RAZY house? ) and it has been very rewarding. Very few challenges, we really are lucky, and I know it will be really hard when it comes time to let her go. But I will, and then I will take another in to love...and over and over. The thing I find funniest about the little dog - he has NO clue he is so small. He holds his own, has from day one. The only time I see the big guys showing their playful sides is when he's biting at their toes, noses, tails, whatever. Then they jump and chase him like they're puppies. Too funny... And I can't believe I forgot to include my fat rescue cat in the lineup, George about 6. Though he ignores them all. It's a zoo here. I'll post some pics when I finally get them uploaded. Welcome!!!!! Yay, more rescue Pyrs! I'm the proud mom of 3 pups listed below & 3 human boys. Cassie was rehomed to us Feb '07 by an elderly couple that couldn't care for her any longer, and Sammy came to us from Pyr Rescue in early March '07. Sam had been starved, choked by a too-tight collar, and beaten until animal control took he & his brother away from those jerks. We'd lost Halley to cancer the year before and we were starting to look for another Pyr (one Pyr we thought, ha ha!) so I'd been watching Petfinders thinking that we'd love to rescue vs. buy from a breeder this time. One day I saw Sammy (or his brother, we still don't know which) on Petfinders posted by animal control, so I called the shelter about him but they said that he'd been adopted, so I left my ph# in case another Pyr or other giant breed came in. A week later the shelter called me and asked if they could give Cassie's original owners my number & that's how we got her. 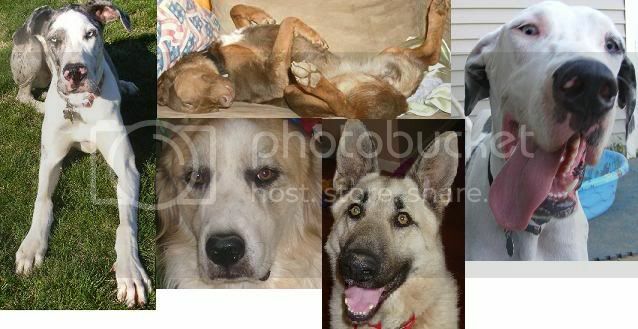 Around the same time, Pyr Rescue e-mailed me Sam's pic & bio and asked if we were interested. We recognised him as the same dog that we'd called the shelter about a few weeks before. It turned out that just before I'd called the shelter, a good Samaritan had pulled him from the shelter, fostered & then turned him over to Pyr Rescue, who adopted him to us. A long & windy journey, but we were blessed with both Cass & Sam because of that original phone call as well as the kindness of animal control, an incredible foster doggy parent & a dedicated Pyr Rescue. We've had them both just over a year now. They get along great with Daisy, our sweet older Golden girl & we can't imagine our life without them. Kelli, I just wanted to share our story as a heartfelt thank you to both you & your husband for all that you are doing to help ensure that other homeless & abused "Sammy's" out there get another chance at the life that they deserved all along. Bless you!!! Welcome!!! My name is Amber and I have 3 "Fur Babies" and a "Skin baby " on the way!!! We have Bell our 3 year old Wiemeraner, Baxter, our 2 year old Springer spaniel, and Buble (BOOBlay) our 4 month old Springer Spaniel. It is getting to be a zoo around here but we love every minute of it!! I love Pyrs! I was lucky enough to become close to two Pyr's whose owner told me about this website and I am so glad she did! Love this pic of Morgan from last night. I call it her "Pardon me sir, do you have any Grey Poupon??" face. She is such a clown. Have a great day! Welcome. I just became a member a few days ago myself and just love this site. I am addicted. I check it more often than my own email and work related sites. My husband surprised me with two Newfie pups, Sophie and brother Syrus, this Christmas (he was under the impression I would choose just one - silly boy). We also have a 13yr old Chihuahua, Chili, who has been an only child for about 5 years now. Needless to say he is not as thrilled with the newcomers as we are. He is quite the little tyrant, which only excites the pups. "We just want to play" It is quite comical to watch but one misplaced plop of a 100lb puppy paw could be disastrous for the little guy so we keep it to a minimum. They are starting to realize to leave the grouchy old man alone. We are empty nesters now and it doesn't take Freud to tell me these pups are my replacement children. We have always had multiple pets and have dearly loved every one of them but I have been a little embarrassed at how over the top in love with these guys I am. I'm sure that is one of the reasons I love this site so much. We are all over the top in love with our guys. I also want to thank you for your rescue work and fostering. I wanted to do a giant breed dog rescue when we first started thinking about another dog, but as I mentioned my husband surprised me. He's been traveling a lot lately and I think he felt a little guilty about leaving me alone. I was not at all impressed with the breeder who showed up with the pups, and follow-up communication has been nill. So in my own little mind I feel like I did rescue these guys. I just skipped a few steps. Who knows where they would have ended up. The pups were 4 months old when we got them and she was having a hard time placing them. She offered us a "deal" if we took them both. Sounds like a reputable breeder to me. welcome!! I am also new and look forward to all the benefits of meeting other pyr crazy people :p Your family sounds wonderful and about as busy as mine. Please check my intro post to learn more. Hi and welcome (officially) to BPO! I'm Stephanie, Mom to Sierra the Newfoundland. 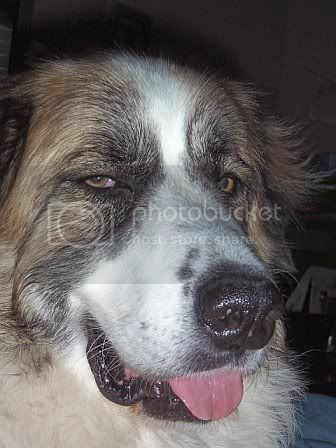 I know, not a Pyr *GASP* . You'll meet lots of wonderful people here and if you're not already, you'll soon be addicted to this place. I have zoo also - only one dog, but also three spoiled fat cats, a ferret, a duck, numerous fish and frogs, six whitetail deer, plus two fawns that are in the house sleeping in my closet. Add in a 17 year old girl and a 12 year old girl who thinks she's 17, and it's amazing I still have my sanity! Can't wait to see more pics! Pics are a requirement here. Don't ever think you are boring us with lots of pictures...we never get enough! !